This is a guest post by Franziska Funke1 and Linus Mattauch2. 1Institute for New Economic Thinking at the Oxford Martin School, University of Oxford. 2Institute for New Economic Thinking, Oxford Martin School, and Environmental Change Institute, School of Geography & the Environment. University of Oxford. Putting a price on carbon is the most effective economic tool for meeting the goals of the Paris Agreement on mitigating global climate change. While carbon taxes and emissions trading schemes are key policy instruments in climate change mitigation, the level of carbon prices varies widely and there is too little coverage of emissions to achieve the targets of the Paris Agreement. Why is carbon pricing in some countries more successful than in others? This post1 is based on a new study in Nature Climate Change,2 published last week and coauthored by one of us. We identify political acceptability as the biggest challenge for the passage and preservation of ambitious carbon pricing schemes. Lessons from behavioural economics and political science demonstrate how the design of carbon pricing reforms and the use of revenues could be tweaked to enhance their acceptability to the general public. We argue that redistributing carbon pricing revenue as a regular carbon dividend is the single most promising option for enhancing political acceptability, although other ways of using the revenue can be appropriate in given circumstances. Climate change is expected to have significant environmental and economic consequences for present and future generations3. Markets are failing to reflect the costs and risks of emissions-intensive economic activities – emitting carbon is too cheap. Economists agree that putting a price on carbon to internalize the societal costs of emissions is the most efficient way to reach global mitigation targets and prevent disastrous climate change4. The rationale for carbon pricing is simple: Pricing carbon makes carbon-intensive production and consumption more expensive and creates an incentive for economic actors to turn to lower-carbon alternatives – for example, to switch from coal-based electricity generation to renewable energies.5,6,7 The mitigation effect of carbon pricing varies across sectors and is expected to be more modest where tax exemptions are in place. To introduce a carbon pricing scheme, the government can either levy a tax on carbon or introduce a permit-based emissions-trading system. Carbon taxes are explicit in creating a fixed price for carbon to incentivize emissions reductions. Emissions-trading systems ensure that economy-wide emissions are kept below a certain level, the ‘emissions cap’, allowing the market to set the appropriate carbon price. Carbon pricing has the benefit of being a targeted corrective by which we can avoid prohibiting certain economic activities in their entirety and which will ideally not create other market distortions. In addition, carbon prices generate government revenue, which can be used to increase green spending, compensate adversely affected industries and communities or be redistributed to the public. However, while carbon pricing is necessary for decarbonization, it will not be sufficient. Other market failures, such as spill-over effects in research and development, need to be addressed with targeted instruments. Public interventions are necessary to transform existing infrastructure, for example in the electricity and transport sectors. Furthermore, studies of human behaviour suggest that price increases in carbon-intensive products will not be enough to incentivize consumers to shift away from certain emissions-intensive lifestyles. In reality, the stringency of carbon pricing is sometimes compromised to compensate certain emissions-intensive, trade-exposed industries, by free permit allocation or tariffs on imports of emissions-intensive commodities. As carbon prices spread globally, concerns about competitiveness should subside, and losses in emissions-intensive production may be counterbalanced by gains in growing low-carbon sectors. Over the last decade, carbon pricing has been increasingly taken up as part of national or subnational climate policies around the world. The map below shows this for the G20 countries, which are responsible for around 80% of the world&apos;s annual CO2 emissions. A total of 51 carbon pricing schemes have been implemented or are scheduled for implementation (at time of writing). 25 of these are in the form of emissions trading schemes (&apos;ETS&apos; in the map), predominantly introduced at the subnational level, and 26 in the form of carbon taxes, mostly implemented at the national level. Among the countries that have already submitted their Nationally Determined Contributions to the Paris Agreement, 88 countries have stated their intent to implement carbon pricing as part of their national climate policies. Carbon prices vary widely across existing schemes. Success stories such as that of Sweden – which currently has the highest carbon price in the world at US$139/tCO29 – demonstrate that it is indeed possible to make carbon pricing work: While the Swedish economy grew by 60% since the introduction of the Swedish carbon tax in 1991, carbon emissions decreased by 25%.10 However, the carbon price under most schemes is still lower than US$10/tCO2. The High-Level Commission on Carbon Prices (2017) estimates that achieving the goals of the Paris Agreement requires a carbon price of $40-$80/tCO2 by 2020, rising to $50-$100/tCO2 by 2030 (when combined appropriately with other policies).11 Currently, less than 20% of current global greenhouse gas emissions are covered by a carbon price and most prices are below the $40-80/tCO2 range. Even though carbon pricing schemes are spreading, their global scale and ambition is not yet in line to achieve the necessary emissions reductions. How can more ambitious carbon pricing policies be introduced? In their new research, drawing from recent insights from behavioural and political sciences, Klenert et al. (2018) suggest that the way in which carbon pricing revenues are spent plays an important role in determining whether a carbon pricing initiative will be successful.12 Global carbon pricing revenues are already substantial (USD $33 billion in 201713) and are likely to increase in the future. How they are used thus plays a major role in the public perception of carbon pricing. Factors related to the public perception of a carbon pricing reform, such as the salience of benefits, cultural world views or general trust in politicians, help explain why some carbon pricing schemes are currently (un)popular. We summarise lessons from political science and behavioural economics on how carbon pricing could be made more attractive to the public. Political science yields two main insights regarding carbon pricing: First, ambitious carbon pricing is often correlated with high political trust and low corruption levels (see Figure 2). 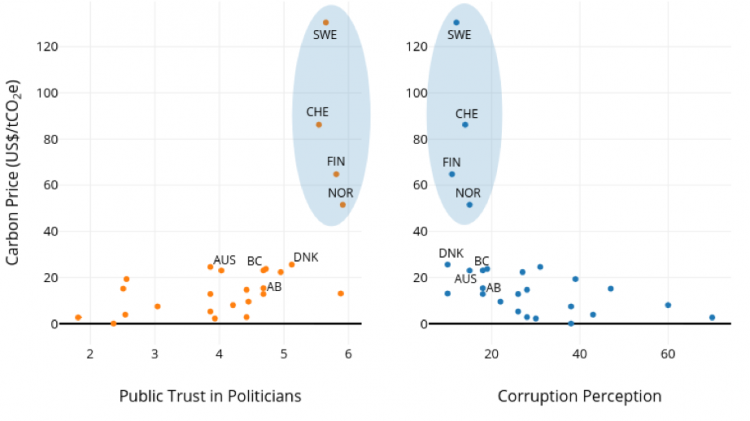 Cross-national studies indicate that countries with greater public distrust of politicians and perceived corruption persistently have weaker climate policies and higher greenhouse gas emissions.15,16 This is exemplified by Finland, Norway, Sweden and Switzerland, which all exhibit high levels of trust and are currently the only countries that have carbon prices above 40$/tCO2. If trust is low, revenue should thus be recycled using a transparent, trust-boosting strategy to enhance its acceptability. Second, a policy reform is more likely to be successful if its costs are diffused and the benefits are concentrated. The challenge with carbon pricing is that it tends to have diffuse benefits and concentrated costs, such that the scattered beneficiaries of the policy are less likely to support it in the political process than carbon-intensive companies are to oppose it. Success may be more likely if the benefits of carbon pricing reform are concentrated on constituencies who will actively support the policy&apos;s passage and preservation.17 Additionally, carbon pricing schemes are more likely to survive successive partisan changes in government if they benefit constituencies across the political spectrum. Four major effects emerge from behavioural science regarding the acceptability of carbon pricing reforms. increasing the salience of the benefits derived from a carbon-pricing reform enhances acceptability, so that visible revenue recycling may be advisable. Some recycling methods, such as transfers to households or public investment, might be more visible to the public than tax cuts, for instance. 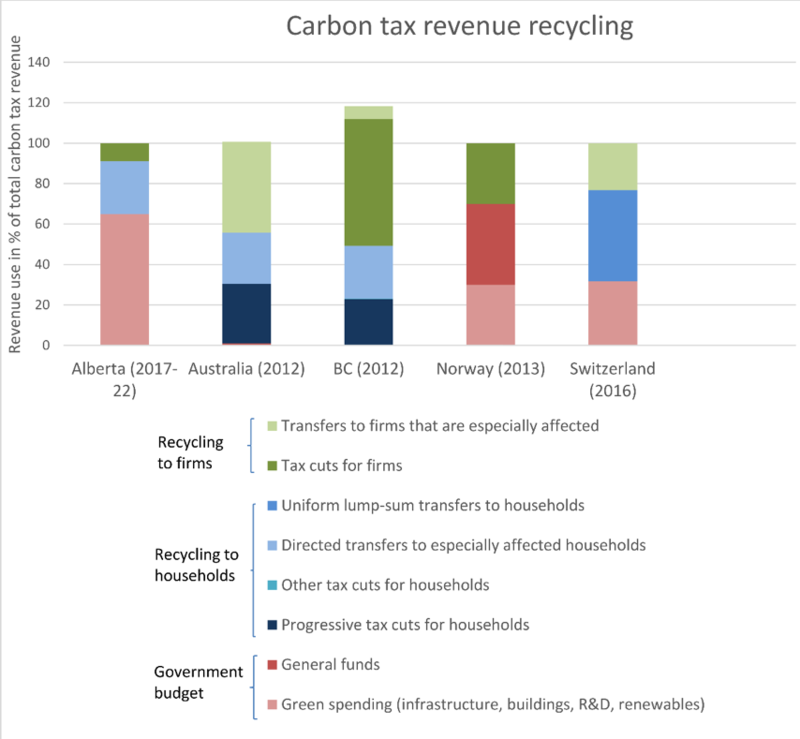 In reality, we observe mixed strategies for spending the carbon pricing revenue, see Figure 3 for an overview of revenue recycling in different carbon tax schemes. However, successful carbon pricing initiatives have designed their revenue recycling in accordance with at least some of the presented political and behavioural effects. The success story of Sweden’s world-leading carbon tax may partly be owed to extensive public dialogue and social deliberation, which may have reinforced political trust and transparency prior to the fiscal reform that introduced carbon taxation. The revenues of Alberta’s successful “carbon levy” are split between green spending and compensation for those who are disproportionately affected by carbon pricing, thereby illustrating lessons on labelling and the ignorance of Pigouvian pricing. British Columbia, where all carbon tax revenues go to households and firms, has created strong constituencies in favour of carbon pricing. Backed both by an environmentally aware electorate base and the business community, the center-right government was able to design a carbon tax reform that enjoys broad political acceptance. The Australian carbon pricing scheme provides a cautionary tale. Introduced in 2012, the recycling strategy was designed "by the book", taking into account insights on equity and efficiency. However, due to problems of political credibility, lack of a convincing narrative, and a public debate too focussed on technical details, the tides quickly turned against the Australian carbon price in the then aggressive political climate. The system was abolished in 2014, demonstrating that a carbon price design that meets equity and efficiency goals alone is not sufficient, while politics and political communication are of crucial importance. In light of the current gap between actual carbon prices and those required to meet the world&apos;s climate targets, lessons from behavioural and political science can help design carbon pricing schemes which are more acceptable to the public. Our research finds that recycling revenues as lump-sum dividends addresses most of the political and behavioural barriers. However, there is no "one size fits all" solution: In certain political climates other recycling methods such as green spending, targeted transfers or tax cuts could be more appropriate. In reality we generally experience mixed recycling strategies. Ultimately, designing revenue recycling mechanisms with an eye on behavioural insights and in accordance with the political context can help make carbon pricing a political success. A part of this blog post first appeared on Vox.Eu on July 30, 2018, see: https://voxeu.org/article/making-carbon-pricing-work-citizens. The post is based on the research of Klenert et al. (2018). Keohane, M. N. O., & Olmstead, S. M. (2016). Markets and the Environment. Island Press, Washington. Investigations into the causal effect of carbon pricing policies, such as the European Emissions Trading System and carbon taxes in Scandinavia, show that carbon pricing is indeed a significant driver of emissions reductions. [ref]Petrick, S., Wagner, U. J. (2014). The impact of carbon trading on industry: Evidence from German manufacturing firms, Kiel Working Paper, No. 1912, Kiel Institute for the World Economy (IfW), Kiel. Bruvoll, A., & Larsen, B. M. (2004). Greenhouse gas emissions in Norway: do carbon taxes work?. Energy policy, 32(4), 493-505. Bohlin, F. (1998). The Swedish carbon dioxide tax: effects on biofuel use and carbon dioxide emissions. Biomass and bioenergy, 15(4-5), 283-291. Edenhofer, O., Knopf, B., Bak, C., & Bhattacharya, A. (2017). Aligning climate policy with finance ministers' G20 agenda. Nature Climate Change, 7(7), 463-465. Online here. High-Level Commission on Carbon Prices (2017). Report of the High-Level Commission on Carbon Prices. Washington, DC: World Bank. Available at: https://www.carbonpricingleadership.org/report-of-the-highlevel-commission-on-carbon-prices/. All carbon prices are for 2016, except for data for Australia, which is for 2012. Rafaty, R. (2018). Perceptions of Corruption, Political Distrust, and the Weakening of Climate Policy. Global Environmental Politics, 18 (3) 2018 (forthcoming). Olson, M. (1965). Logic of collective action: Public goods and the theory of groups (Harvard economic studies. v. 124). Harvard University Press. After economist C.A. Pigou (1877-1959), who prominently argued that a negative external effect of an economic activity should best be regulated by collecting a tax that is equal to the social costs of this external effect. See Klenert et al. (2018) for further details. Note that the spending in British Columbia exceeds 100% since the region committed to additional spending.